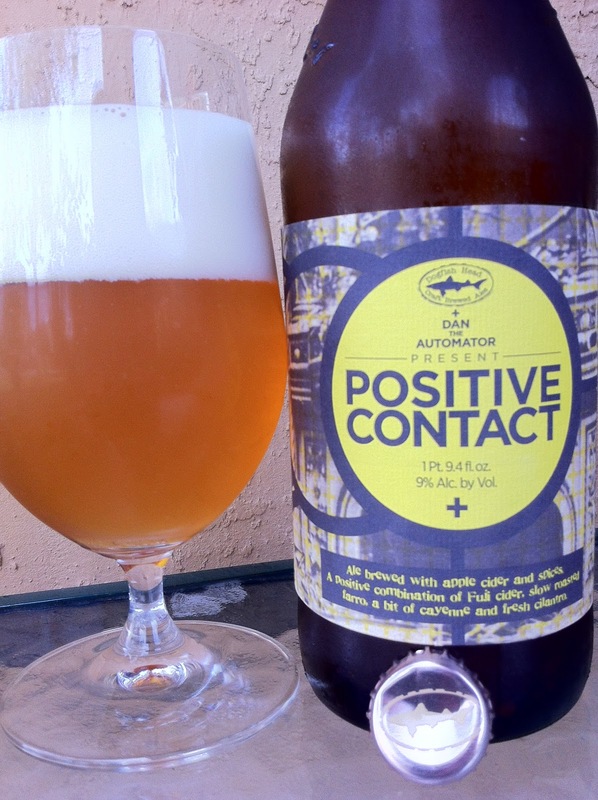 I decided that today I needed to check out Positive Contact brewed by Dogfish Head Craft Brewery in Milton, Delaware. It's been sitting in my fridge for months, and I figure that I really should finish their last music beer collaboration before winning a contest for the next one. Yeah, Dogfish is collaborating with the Grateful Dead to make an Imperial Pale Ale named American Beauty. I've entered a bunch of times and know they already have over 1000 entries, so good luck. Enter your "A" material and skip the BS entries! You can read all of mine (so far) below to see what you're up against. This wine-bottle sized beer was originally packaged with 4 or 6 of the beers and a record or something like that. I don't quite remember. Since then, the packs have been broken up and sold individually since the hefty price tag was weighing on sales (that's my analysis). I actually just went in with some guys initially and we broke it apart ourselves. I never did get to listen to the music by Dan The Automator and Deltron 3030, but I'm good with that. If you can even understand this Wiki entry for them, you are way cooler than I.
I'm sure the label art means something, but I don't know what. Front and center is the name of the beer. They do let you know you are about to drink an "ale brewed with apple cider and spices. A positive combination of Fuji cider, slow roasted farro, a bit of cayenne and fresh cilantro." Rock and Roll! Frothy head. Smells like apple cider with wheat and spicy coriander. Very different flavors, let me start with that! The refreshment is there though, and I deserve it after burying this year's Dogfish Olde School in my back yard! Fruity apple, tangy with some very prevalent coriander and some other interesting spice. A little cinnamon type flavor which I attribute to the cayenne. Carbonation is effervescent and soda-like. The Belgian yeast and wheaty texture/flavor are also noticeable standouts. There is a minty accent dodging in and out. You can say that's the cilantro if you want, but it's hardly identifiable. We rock cilantro in this house, so I am well aware of its flavor. Lots going on in this beer, for sure, but the flavors really do work in harmony. The spice flavors really build toward the end which is when you also start feeling some heat and effects from the 9% alcohol. Very different, nice flavors. The yeast that you get in your glass when you pour too fast or too many times was a distraction in my later pours, so find yourself a handful of pals and pour it all out one time, carefully. Recommended for sure. I think you can probably still find this on the shelves in many places, even though the release was a while ago. You already used myrrh in your Birra Etrusca Bronze. Gold is too expensive, and frankincense was the last gift given to baby Jesus. Cornell '77 legendary concert. I went to Cornell and though I was only 5 when this concert took place, the "hippie effect" left behind by the Dead is still in effect. A few friends and I went to the reservoir to swim. Hippie chick dropped her clothes and showed her hairy body as she walked past. When she was done, they lit up incense... "frankincense". Yes, it's edible and often used in traditional Asian healthy skin medicines. No one knows more about "acid" that the Grateful Dead. Follow me on this story. Jerry Garcia died of a heart attack while he was actually in rehab in 1995. Do you know that the American Heart Association recommends that people with high risk of heart attack take a regular regimen of aspirin (under doctor's orders, of course). Well, aspirin is really known as acetylsalicylic acid. How ironic that acid would help the heart attack of someone that was known to acid. Anyway, aspirin isn't recommended for regular drinkers, so my ingredient is Vitamin C, Ascorbic Acid. The Grateful Dead are responsible for a lot of flower children. I have a few second cousins that were the product of Dead inspiration. You should meet their parents. What flower symbolizes this impression the Grateful Dead made on the world? Well, considering this beer is to be named American Beauty, and Sugar Magnolia is a song from that album, I think you have a winner. The flavor is intense and versatile, perfect for a Dogfish beer. Some of my favorite Grateful Dead memories are from concerts I wasn't even able to attend. The Dead was notorious for encouraging sharing of their music and events. Remember, "Googling" didn't exist and the internet was barely alive when Jerry Garcia died. Between college friends and some of my older relatives, I've been able to see some cool old footage and great music. Yes on cassettes and grainy tapes. That is part of the experience. Gladiolas stand for sharing and generosity, qualities the band promoted. And I think this will make a terrific flavor addition to a strong pale ale. I've been listening to Dead songs on YouTube for two weeks straight to get more inspiration. Now I know that Dear Mr. Fantasy is a cover but I'm jamming now as I write this. What ingredient or ingredients go with this song? Hmmm. Has to be an entire Fantasy Bouquet: I was thinking Puppy Dog Kisses, Rainbow Glow and Unicorn Eyelashes. As for those being readily available, well, you guys have an imagination right? Oh. There are other ingredients for this Fantasy basket if you want to hear more. I like your ASA entry. Just saying. I had a sample of this at GABF, I should have bought the bottle at the Saucer when I found it but passed because I was going to a beer party afterward. My loss? What do you mean by ASA? Sorry, I'm killing myself trying to figure it out. The aspirin one. My bad. AcetylSalicylic Acid. I kind of just went with it. Pretty good though.